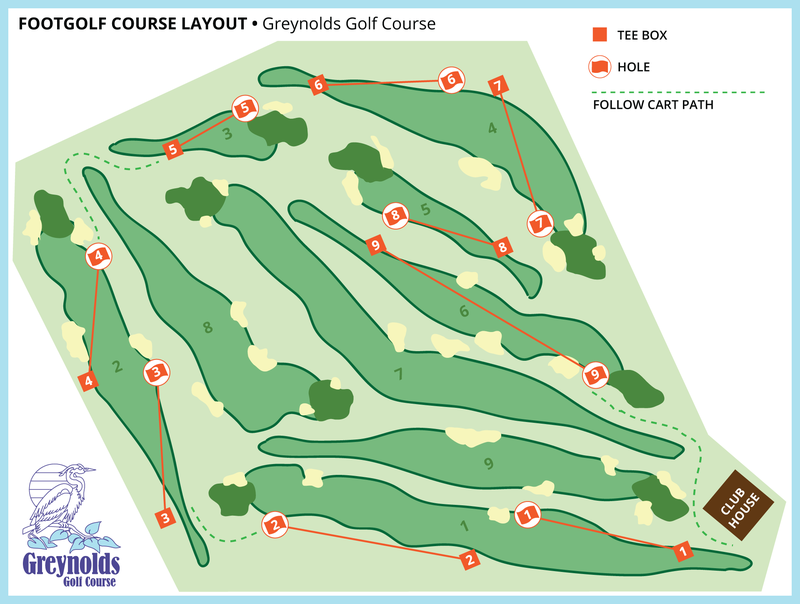 FootGolf, which combines the popular sports of soccer and golf, can now be played at Greynolds Golf Course. FootGolf is a combination of soccer and golf. The game is played with a regulation #5 soccer ball at a golf course facility on shortened holes with 21-inch diameter cups. The rules of FootGolf largely correspond to the rules of golf. FootGolf as a game is played throughout the world in many different forms, but as a sport it is regulated by the Federation for International FootGolf (FIFG). The American FootGolf League (AFGL) is the exclusive member of the FIFG and governing body for the sport of FootGolf in the United States. Soccer cleats are NOT permitted on the course. Indoor soccer shoes or turf soccer shoes are recommended. Sneakers are allowed. Allow faster or smaller groups to play through. Please keep pace of play moving. Replace the flag after completing each hole. Never drive carts on or near greens or bunkers. Junior rate applies to players 17 years of age and younger.